If you are searching for the perfect gift idea for that special child on your holiday shopping list then I highly recommend checking out your local Lakeshore Learning retail location and/or head over to browse the entire selection of products online at their website. Lakeshore Learning offers an excellent selection of holiday gift ideas that are both educational and fun so it is sure to be a hit with the lucky recipient. I am a huge fan of Lakeshore Learning because all of the products that I use in our home school or for playtime have been made of the highest quality and is always lots of fun for my children. I also appreciate that Lakeshore Learning offers a wide selection of toys, educational resources and products in a variety of price points so there is sure to be the perfect gift idea for every budget. In fact, there are even great gifts under $10 and under $20! Here are a few of my favorites that would make excellent gifts for children of all ages this holiday season. 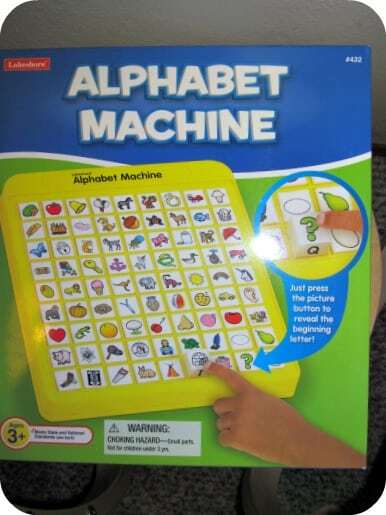 My five year old son and six year old daughter love The Alphabet Machine ($19.99) which is great for both home and to keep the kids busy learning while traveling too. This creative learning toy is lots of fun with vivid colors and images and my children love that they can press the button and the letter pops up. I appreciate that it helps them learn their letter sounds (and letters for younger children) and The Alphabet Machine features all of the consonants and the long and short vowels too. On sale for only $9.99 (originally $24.99), the Crystal Climbers is a great gift idea for children who like to build and create. They are sure to love playing with the 170+ crystal colored pieces that easily slide together with a special slotted design that appears to “climb” in an infinite number of designs! My children play with this set all the time for long periods of time…it really holds their attention and I love that it promotes their creativity and best of all it is “battery-free”. It is always fun to see what they create with their Crystal Climbers set! 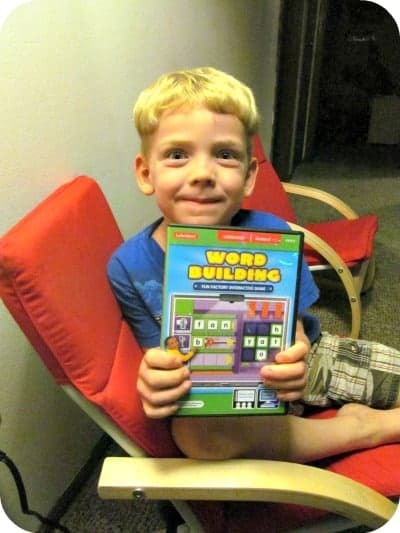 My seven year old son takes after his father so I knew that the Build It Yourself Wood Working Kit ($29.99) would be a great gift for him. In fact, it is even better than I thought when looking at this kit online and I have spent a lot more money on other brand wood building kits that didn’t include half of what this set offers. I love that my son and husband can spent valuable time together working on these projects too! In addition to the wood, this kit includes everything needed (nails, lightweight hammer, glue and instructions) for the child to build wooden projects with confidence. I also appreciate that between projects, everything stores neatly in the wooden project box so clean up and storage is a breeze. Finally, for computer savvy kids like my five year old son, Lakeshore Learning has a huge selection of educational computer software and downloads that make learning fun. My children are “building” words using the Word Building Fun Factory Software (on sale for only $9.99). My young children have shown improvement in their ability to spell three letter words in the short time that they have been “playing” this game during computer time. I am very impressed with the content and the way that all of the Lakeshore Learning educational software titles are engaging and really holds their interest as they learn new concepts and skills. You are invited to visit Lakeshore Learning to browse the entire selection of holiday gift ideas. I just found the perfect gift for my daughter so I am headed to my local retail store this week to surprise my little “animal-lover” with the neat and very unique Pet Vet Center ($29.99)! Check out all of the special offers or find a location near you. Thanks for sharing some great gift ideas! This would be a great gift for my niece she is starting to learn her alphabet and needs a little more help or a way to make it fun for her.This would be perfect.